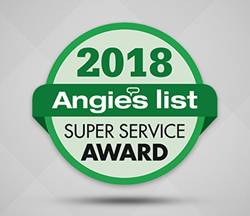 Sir Grout Central New Jersey earns Angie's List's 2018 Super Service Award for their high-quality customer service. The fact that Angie's List has chosen us for the fifth time in a row is a testament to our commitment towards a work ethic that's both impeccable and worthy of Sir Grout's name. Sir Grout Central New Jersey takes pride in having received Angie's List's distinguished 2018 Super Service Award for its excellent customer service. This sought-after award recognizes the hard work of professionals in the residential and commercial service industry. Through their continuous delivery of top-of-the-line hard surface restoration services and their ability to keep customers satisfied, Sir Grout Central New Jersey earned the recognition of Angie's List's users in the form of positive reviews for the fifth year in a row. "We couldn't be prouder of this award. Receiving this prize not only confirms that every single one of our clients has found our work to be exceptional, it also means the standards we have set upon ourselves have paid off," stated Kris MacDermant, owner of Sir Grout Central New Jersey. "We plan to keep improving the caliber of our services to cater to our ever-growing clientele. The fact that Angie's List has chosen us for the fifth time in a row is a testament to our commitment towards a work ethic that's both impeccable and worthy of Sir Grout's name," he added. For the past two decades, Angie's List has been serving as the link between customers and businesses in the residential and commercial service industry. This website contains a large catalog of service providers who are rated by consumers based on the quality of their work. Depending on the consumer's ratings, the services provided by a company can be graded on a scale from an "A" to "F." Only companies that have maintained an "A" rating are eligible to receive the Super Service Award. Sir Grout Central New Jersey's customers have always provided a plethora of positive ratings, testimonials, and reviews, giving them the opportunity to stay on top for five consecutive years. "The Super Service Award logo has become a symbol that consumers look for as a sign of quality," stated Angie Hicks, founder of Angie's List. Sir Grout Central New Jersey has obtained this distinction not one, but five times thanks to the effort put into every single job they have performed. Their trained techs, innovative methods, and fantastic products offer the best possible solutions to customers in dire need of a hard surface restoration. The best way to request Sir Grout Central New Jersey's products and services is by calling them at (732) 551-3737or by visiting http://www.sirgroutcentralnj.com and schedule a free consultation.